Company Overview - Guangdong EXSENSE Electronics Technology Co., Ltd.
10YRSGuangdong EXSENSE Electronics Technology Co., Ltd.
Exsense Electronics Technology Co., Ltd. is a private high-tech company, involved in the Production Selling, R & D of NTC thermistor, temperature sensor and electronic materials in question. Depending on the strong cooperation in circle, we provide complementary service for various electronic components. Adopting advanced semi-conductor processing system, combining with NTC Thermistor and temperature sensor and electronic materials with our own intellectual property rights, and using high precision material processing, cutting, sealing, packing and testing equipment from Japan, Taiwan and Germany, we are able to manufacture in batchs. Meanwhile, through creative management and intensive quality control, we assure the high stability and reliability during continuous production. 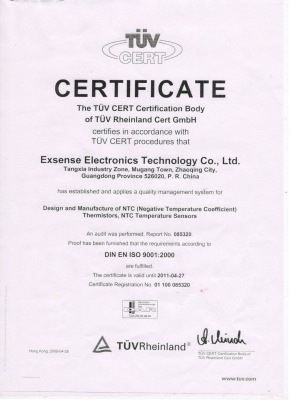 At present we mainly manufacture items as follows: AT series -- high precision dip NTC thermistor, LT series -- small size high precision dip NTC thermistor, BT series -- high precision NTC thermistor for battery pack, IT series -- high precision NTC for electronic thermometer, CT series -- chip NTC thermistor, FT series -- film type NTC thermistor, GT series -- glass sealed NTC thermistor, PT series -- power type NTC thermistor, TS series -- NTC temperature sensor, OT series -- OA (office automation) NTC thermistor & temperature sensor, VT series -- NTC thermistor for vehicle temperature sensor & thermo switch making, VTS series -- vehicle temperature sensor & thermo switch, MT series -- NTC thermistor for medical temperature sensor making, DT series -- die (bare chip) NTC thermistor, DTV series -- die (bare chip) NTC thermistor for vehicle temperature sensor & thermo switch making, and DTM series -- die (bare chip) NTC thermistor for Medical temperature sensor making. We keep bringing forth new ideas and possess various intellectual property rights in the field of temperature sensor and electronic materials. We keep improving our R & D and cooperating with people in this occupation. We work hard to supply our customers with both high-tech products and quality service. We pursue our management philosophy as following:	Striving for perfectiont--------quality cast brand;	Sharing development---------repay staffs and society;	True Practice-------------------enterprise serve our country.